These are Shias observing Ashura in Pakistan a couple years ago. They are taking cover because they are under gunfire attack by their ‘fellow’ Muslims. 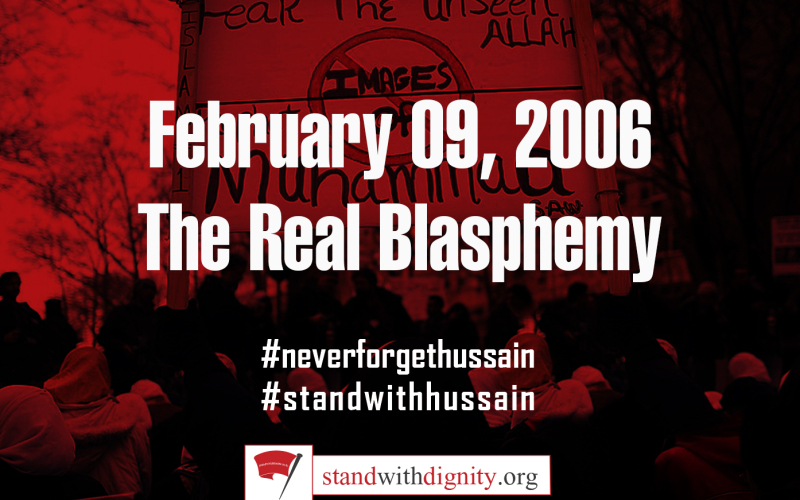 Every year, scores of people are killed for observing Ashura, violence which to me is infinitely more blasphemous than a bunch of silly cartoons published in a third-rate European country. 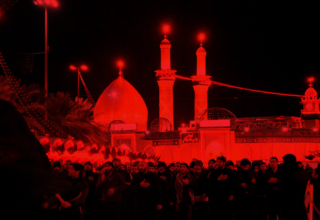 In Iraq alone, over 200 people have been killed on Ashura the last two years. Today, a suicide bombing in Pakistan killed at least 27 during Ashura rituals. I know several guys named Osama. None of them are the infamous Osama, and each of them are kind and gentle guys. The name Osama is storied and noble one, meaning ‘lion; and it is a shame it has been corroded by association with the Big Nasty. 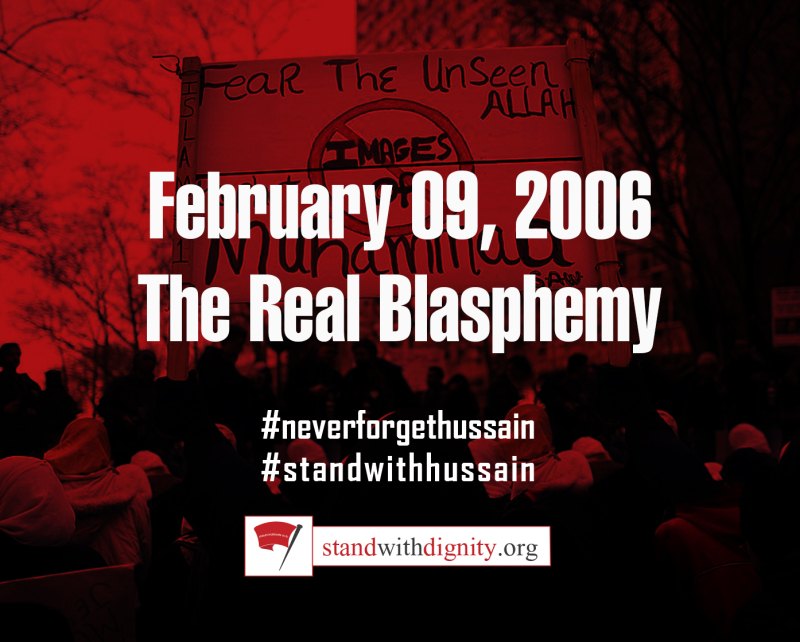 Another name that has been shamed by association is Husain. The name immediately conjures the mustachioed face of America’s deposed arch-foe, Saddam Husain. 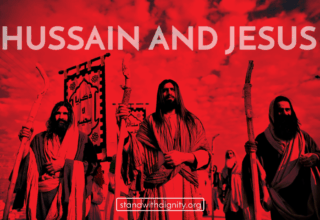 In the modern mind, this latter-day bogeyman unfortunately eclipses one of great figures of religious history, the original Husain, grandson of the Prophet Muhammad. I got up bright and early today, or rather dark and early, to head down to Sayyida Zainab for the annual Ashura commemoration. It was bitter cold, perhaps the coldest so far this year, and I looked up to see snow on the top of Mount Qassioun. Apart from the weather and flooded roads. Life went about as normal for most of Sunni Damascus. 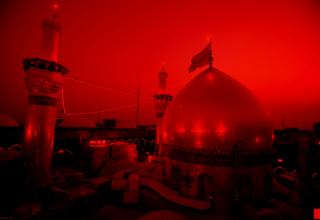 But Sayyida Zainab was closed up, somber, black-clad Iraqis and Iranians sloshing through the muddied streets on their way to Ashura observances. When I arrived at the shrine, I could hear the trademark chant of the Maqtal or death narrative of Imam Husain being recited across the way. The recitation hall spilled over with people who stood beneath all the black banners scrawled with prayers and tributes to Husain. Crowds gathered around the door of the building and up and down the street to hear the story of how Imam Husain and his companions were brutally killed on this day over 1,300 years ago. 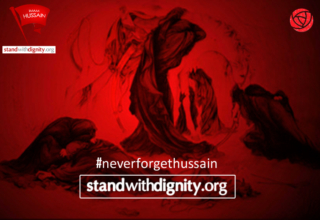 Husain was hunted down because he refused to give allegiance to an early Muslim dictator, Yazid ibn Muawiyah. 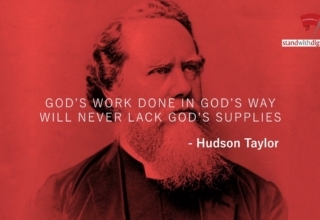 But these stories awaken something more than mere history in the hearts of believers. They call people to live just lives, to make real sacrifices to do what’s right, to resist oppression, and to meet the inevitable end with pious courage. I attended another Maqtal at a recitation hall on the other side of the Zainab Shrine. The white turbaned sheikh sat up on an elevated chair and recited from a book in simple Arabic. Slow, mournful, and deliberate, the whole thing took two hours. He started with Ashura morning, and how Imam Husain turned to his followers after Morning Prayer and told them to make peace with God, that most of them would not see the end of the day. As the story went on, more and more of the Imam’s companions were killed, leading up to his half-brother Abbas, his grown son Ali Akbar, and even his infant child. As the Imam himself took to the battlefield, the men in the hall were howling with cries. People know the stories intimately, and even a passing reference to an event at Karbala can send the crowd into fits of emotion. For instance, as the Imam heads for the battlefield, the reciter might say, “But the Imam paused. He heard a small voice calling out…” and people start weeping uncontrollably. They already know what comes next, that Imam’s young daughter has come to say goodbye, and will ask him to let her ride on his shoulders one last time. After the Imam is killed, the reciter begins calling out lines of poetry in dirge-like rhythm and the believers rise and begin striking their chests with an open hand along with the beat. It is very rousing. One time I heard this done in the courtyard of the Imam Raza Shrine in Iran where thousands were attending. It sounded like the roar of a giant wave. In some places, this mourning ritual morphs into the bloody flagellation which unfortunately shrouds the deeper meanings of this extraordinary religious event. Brian Anthony grew up in Wyomissing. He had lived in the Middle East for nearly seven years. He and his family recently returned from Damascus, Syria, where Brian had worked as a teacher. Join him for an inside glimpse of day-to-day life in this fascinating and volatile region.